First, this concept was obviously greenlighted by a TLG executive who'd just seen a wall-full of those Funko Pop figures. Second, now that LEGO Dimensions is over with, Brickheadz seems to be the new home of TLG's odder licensing decisions. Maybe this doesn't bother anyone else, but I find that pink brick of brain just a trifle unsettling. Anyway, all snark aside, LEGO seems to be throwing a lot of weight behind these, so I hope they do well. Anybody else have any of these? I made my first opinion after I bought Captain America Brickheadz...I was completely "meh" about the whole thing. And I am a huge Cap fan. But I kept him together sitting on my computer desk. I had zero intentions of buying any more because...meh. So then my LUG decided to do a draft with Go Brick Me. Side note...that set is SOOOOOOO worth it as just a parts pack alone. Not kidding, check it out. Great parts, little price. But before we started to sort to draft, we all had to draw another lug member's name and "brickheadz" them. It was actually a lot of fun to do. Then we gave that as a gift to the person we built...then drafted the huge amount of remaining bricks. Yeah the pink brain is weird...very weird. But hey, I'm pro pink bricks. I guess I am very much on the side of build your own brickheadz and have fun with it...but "meh" about the actual LEGO ones. I have yet to acquire any birkcheads of yet but I am interested in them. I am planning to get the Go Brick Me set (mainly for the sticker sheet). However I do agree that the pink brick is a little unsettling. I quite agree the Build your Brickhead is a great set for parts. Also, a rather nice sticker sheet, if I do say so. As far as the actual theme goes, I think there is too many, too fast, certainly in the past month. Every week we are getting an announcement of a new pair of Brickheads. I have the two Pirate of the Caribbean ones, and most likely going to pick up A couple of the upcoming Star Wars ones, but overall the theme has little to attract me. And your first thought is so true. the resemblance is obvious. I didn't find the pick brick unsettling. Amusing, perhaps. Hey everyone, so I will chime in on this. 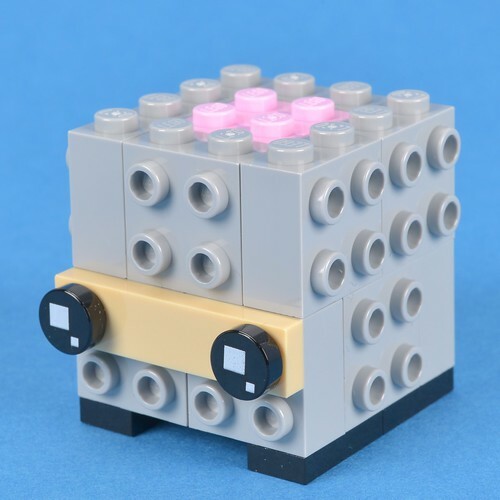 As far as brickheadz go I am not a huge fan. They are certainly a interesting concept. The pink brain is a little weird, and it was actually trans green for captain Salazar. I personally feel that for retail price they are a bit over priced. This of course doesn't include the go brick me set. That set is awesome, so much so we have bought 3 for parts alone. That being said, I have purchased in the neighborhood of almost 50 brickheadz. Now before you fall over I have reason and method to my madness. They make awesome parts packs when purchased on clearance. I usually wait until they are about $4. I have been lucky enough to find them as low as $2 each. I bought a lot of black widow, the beast, etc... Mostly for the dark orange . Also the core of the brickheads make use of great snot pieces for castle walls. So in closing the brickheadz to me are parts packs, and when you find some on clearance, you can't really go wrong. Look at brickset at the parts lists, find the ones that work best for your situation and go to town .